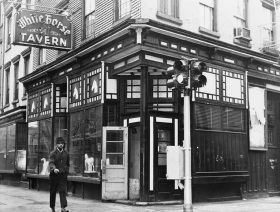 A Village preservation group on Monday called on the city’s Landmarks Preservation Commission to designate the interior of White Horse Tavern a landmark. 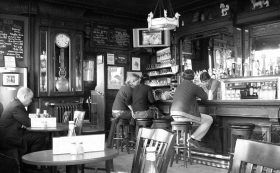 In a letter to LPC Chair Sarah Carroll, the Greenwich Village Society for Historic Preservation (GVSHP) wrote that “the potential loss of the interior of this tavern from a recent change in ownership would be a devastating loss, not only to New York City, but to the country and the world.” The request comes less than a week after the 140-year-old West Village bar was sold to notorious landlord Steve Croman, who once served jail time for tenant harassment. 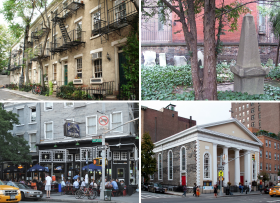 A beloved 140-year-old West Village bar known for its famous poet and artist clientele has been sold. 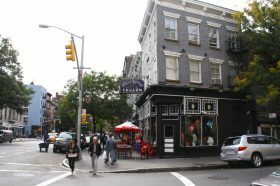 The new owner of White Horse Tavern, which opened on Hudson Street in 1880, is Steve Croman, a notorious landlord who served prison time for tenant harassment, as Jeremiah’s Vanishing New York first reported. And on top of that unsavory news, the historic bar will be run by restauranteur Eytan Sugarman, who recently made headlines for his copycat pepperoni slice at Made In New York that looks identical to that of Prince Street Pizza. But Sugarman told Eater NY he’s taking the bar’s historic details into account. “We are only focused on preserving the rich history and legacy of this iconic institution for New Yorkers,” he said.